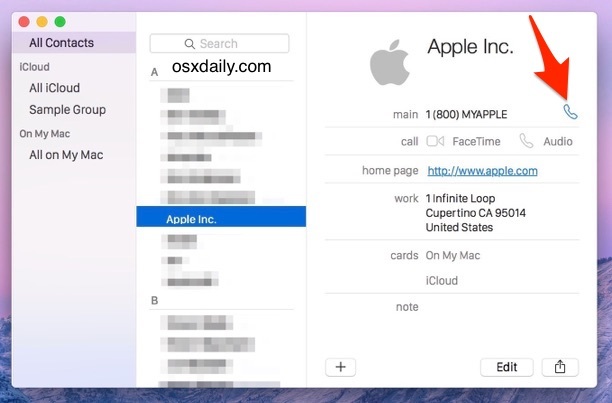 If you have a Mac and an iPhone, you can now make phone calls from your Mac using that iPhone. 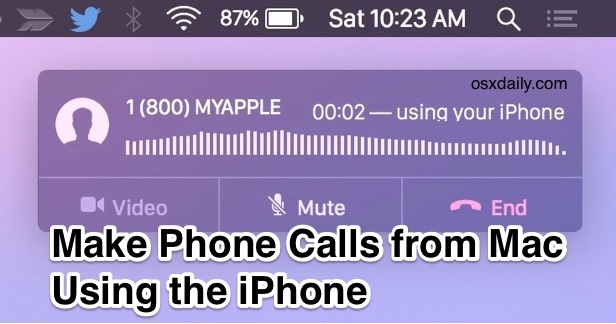 The phone call will sound through the Mac speakers and use the Mac microphone, but the actual call itself routes through the iPhone. This is a part of the Continuity suite, which is really nice feature set in newer versions of iOS and Mac OS X that allow for seamless transition between Macs and iPhones and iPads. Phone calling from the Mac is quite simple to use once you have it set up properly. You do not need to have Bluetooth enabled to use this feature, but you must be on the same wi-fi network, the devices must be using the same iCloud account, and the feature must be enabled in MacOS X and iOS, both of which require a modern version to function (Mac OS X 10.10.x or newer, and iOS 8.x or newer). This is basically the same set of requirements which is necessary for using HandOff, which is another Continuity feature. This is particularly important to double-check that settings are enabled and set properly because many users opted to turn off their Mac ringing with an inbound iPhone call after experiencing it once or a dozen times, which can be desired or annoying depending on the environment. You’ll see a little notification like popup arrive in the top corner of the Mac screen as the call starts, you’ll have the option to mute and end calls using that screen, which remains active as long as the call is active. 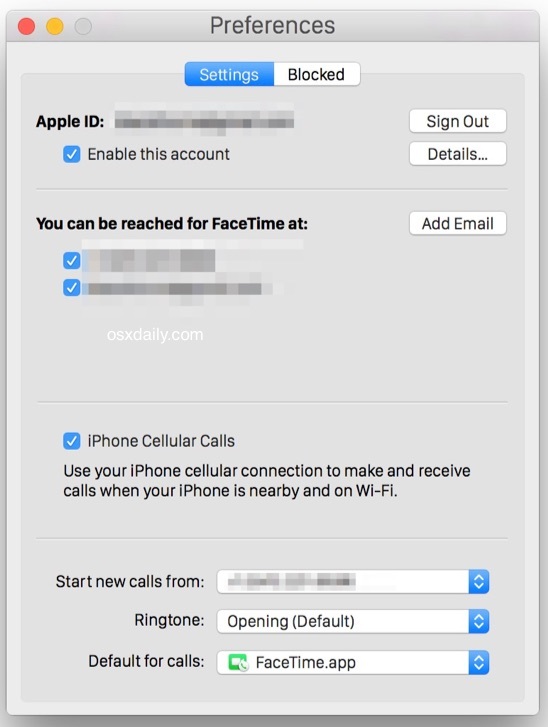 You can also make phone calls from the Mac from the FaceTime app, though if you’re calling someone on another Mac or iPhone it is likely to get routed through the Apple VOIP FaceTime Audio protocol. Additionally, you can make phone calls from Safari by hovering over a number on the web. When calling is configured properly, you’ll also discover that the Mac will receive inbound calls as well. When an inbound call is coming through, a notification will display in Mac OS X, the Mac will ring alongside the iPhone, and you can answer the call in Mac OS X, which again will route through the Mac speaker and microphone (or a headset, if one is in use). While you can stop the Mac receiving calls, if you do so it will not be able to make calls too. 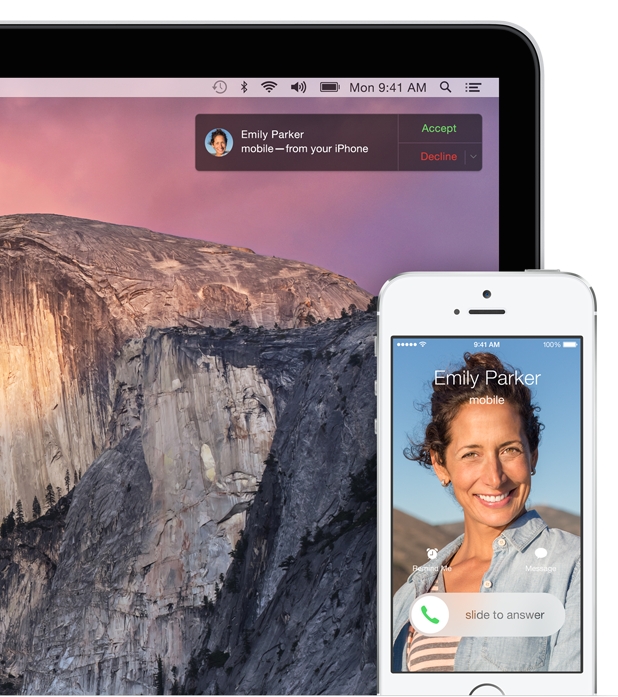 Can You Make Phone Calls from the Mac Without Receiving Them on the Mac? At the moment there is no way to turn off the reception of phone calls on the Mac while maintaining the ability to make phone calls from the Mac, the only option is to change the ringtone on the Mac to a quiet or silent one. This is similar to other iPhones and iPads using the same Apple ID, where device ringing can be disabled too through iOS Settings but doing so will also remove the ability for the same device to make an outbound call. Where is the Number Dialing Pad on the Mac for Making Calls? Great question! Currently, Mac OS X does not have a built-in dialing pad with numbers for making calls to new numbers. Hopefully that will change in the future, but for the time being, you’ll need to turn to the iPhone if you need to use a numerical dialing pad on the call. If you like the ability to make and receive calls on the Mac, you’ll probably also like to be able to make and receive text messages from Mac OS X too, which can be setup with these instructions. I don’t understand why there is not a number pad for dialing numbers, that’s mostly what I want with this. Skype has it, so I use Skype mostly still. Emily Parker from the pic above looks pretty hot. Can you give me her number? i don’t have any of these toggles on my iphone and mac. i have an iphone 6 and it is connected to the same wifi network as my mac. iphone has ios 8.2 and my mac has osx 10.10.2.
i did have these toggles before. i if they disappeared since i turned on the two factor authentication. i just turned off two-step verification on my appleid and i can see the “iphone cellular calls” check boxes again on both the iphone and the mac. looks like two-step verification needs some work. I too turned off the two-step verification, did not work for me??? You can download a third party app called Keypad (formerly continuity keypad) Was free in beta, now .99 cents. & for those who hate Yosemite ? To add more & more filter’s Apple in couples of years going to run on a wall ! wtf are you talking about. good point tony, spot on analysis! @Tony, if you’re only going to be negative, please learn how to use English and a keyboard first. You can also click on any number in a website or browser. I created a Favorites list in Notes and click away. Works on iPad too. Great question! Currently, OS X does not have a built-in dialing pad with numbers for making calls to new numbers. Hopefully that will change in the future, but for the time being, you’ll need to turn to the iPhone if you need to use a numerical dialing pad on the call. Great trick, did not know that! As best I can tell that doesn’t help with entering dialing instructions after connecting on the call. i.e., press 1 if you are fed up being asked to press 1 to speak English in America. I tried clicking all over what I thought was the “phone call notification” but nothing happens. Great feature but the MAC microphone is awful. Any solution for that? Any good external mic that works with mac? One of the best simple external microphones that almost all Mac users already has is the iPhone earbuds headset, they also come with iPad and iPod touch. Plug that into the audio jack and you’re good to go. They work very well for a microphone and headset for phone calls, listening to music, VOIP, etc. small question, this is in fact a great feature, however the sound quality of a call is like worse than late 1970s, is that only in my case? using headset, which gives me crystal clear calls on skype for example. Sure, skype is working by a mch different protocoll, nevertheless, call by headphones directly from iphone is way much better than by continuity, am i missing something ? FYI: for those of us with weak cell reception at home and using WiFi calling, this feature is not available. When you attempt to turn on cellular calls on your iPhone in step 2 above, you get this message: “Wi-Fi calling will be turned off to allow other devices to make and receive call through your iPhone.”, you can then “cancel” or if you “OK” WiFi calling will be turned off to enable this feature. I can receive calls and make calls using my Mac, but my audio cannot be heard by the other party. Any idea what I am doing wrong? I want to my imac for computing, and my phone for making calls. It’s about time apple stopped trying to make every device a jack of all trades, and just made each the best at what it’s supossed to be. The lack of a number pad makes using this feature useless if I want to make a phone call to someone who is not in my contacts. It’s a nice feature, and it works great, but the lack of the number pad is a huge drawback. Agreed, it’s strange to me that a number pad is not included to dial new numbers. Typically the only numbers I’d want to call from my Mac would be one-off calls to things where I’m going to be on hold for a long time so the speakerphone makes sense, not anyone on my Contacts list is going to get a phone call that way. Just type the number in where it instructs you to…pretty obvious! I cannot get this to work on my iMac. Always receive the error “FaceTime and iCloud must be signed in to the same Apple ID to use iPhone Cellular Calls” even though I have only ever had one Apple ID and use it on all my Apple devices. iPhone calls do work on my iPad so I’m at a loss with my iMac. Try signing out of icloud and back in. I get nothing. The little phone shows up in my contacts but hitting it does nothing…. no call, no message, no error, no nothing. Fortunately I don’t really want to talk to my computer anyway. This is a fantastic feature, but we live very remote and depend on getting Internet via iPhone connecting my Mac via hotspot. Unfortunately, this feature does not work with hotspot despite iPhone and Mac and iPad all connected together with hotspot, just not thru a wifi router. You dial the number in FaceTime by entering what? The suspense is killing me Gary, I need to know how to dial numbers from my Mac! 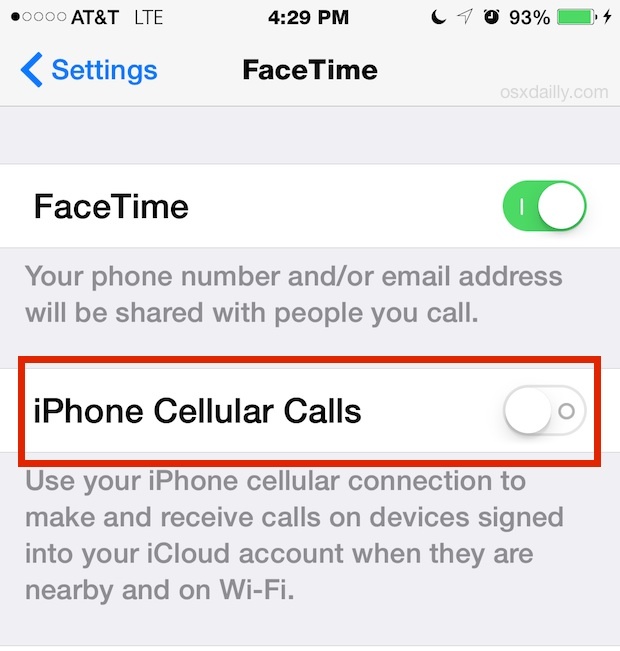 Type the number into the search box in FaceTime, then click the phone icon to the right of it. @Spaghooti, try opening FaceTime and reading the part that says ‘enter number’… its not rocket science. It gives you the instructions for what to do, right where you’d expect it to be. In fact, I’d say if you can’t work that out, then please give your Mac to someone who’ll appreciate it and go back to the whinging world of PC. Because I use a Bluetooth Headset I have had to turn off all possible phone functions on my Macbook Pro, because it constantly tries to grab calls when I am already talking on my iPhone; while I am speaking. So, Facetime is turned OFF – on both devices. Handoff is OFF – on both devices. But the Macbook is still trying to grab calls while I am speaking. I have spoken with Senior Apple Engineers, and to be honest, they haven’t got any idea why this happens. But they tell me they have many people with the problem. I guess this is what I would call a product still in BETA !!!!!!!! My iphone is here near my computer but I should connect to the internet to make a call with it. Ok. Just my voice/texts will route to apple servers when delivering from my computer to my phone. Human voice has unique pattern baby.. like fingerprints or eye’s retina. Matrix is born baby.. No more personality..
Do you know how i change the ‘Calls from iphone number’? i have a Mac, iphone & ipad, and my wife has an iphone and ipad – currently whenever my wife’s number rings all 5 devices ring! I want it so that when her mobile rings, her devices ring and similarly for me. However i cant see a way of change the default number for my devices – only turning them off. Sounds like you are all on the same icloud account.